We’ve now had 20 by-elections in this parliament. There’s at least one more to come. The Liberal Democrats have contested 18 of the 20, and have won only one: Eastleigh, which they held with a reduced majority. They haven’t gained a single extra seat. They have also lost their deposit 10 times. You can see that the party’s average drop in share has got worse as the parliament has gone on. 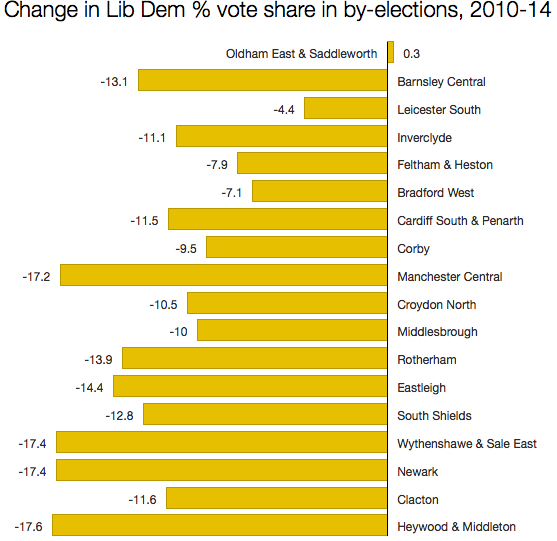 Their performance in Heywood & Middleton was the worst so far – though they managed to cling on to their deposit by a sliver, winning 5.1% of votes. In Clacton, where the Lib Dems did lose their deposit, the drop in share wasn’t quite so big. But the party was starting from a low point, and the result handed them their second worst share in a by-election ever: 1.3%, 0.1 points above the Liberals’ all-time low of 1.2% in Glasgow Camlachie in 1948. The Lib Dems haven’t gained a seat at a by-election since February 2006, when they won Dunfermline and West Fife from Labour. But there’s one thing they’ve achieved in this parliament that neither the Tories nor Labour has managed, and that’s not lose a seat in a by-election. They can, at least, feel proud about that.